Mega Power car radiator service with stop leak, cool, and acid neutralizer. the right way to stop any leak, for better engine transmission cooling. Stop leak is good - if you need it! Ours is good because its a permanent stop leak that stays liquid until a leak occurs - as well as stops your present leak. Works like blood. Coagulates upon contact with air. Non-clogging. Stop leak with conditioner to increase cooling heat transfer by up to 30% is better - when added with stop leak - this pulls more heat away from both engine and transmission - as the transmission sends its fluid to the radiator for cooling. Both are helped in this way. Stop Leak, Cool Conditioner, and System Acid Neutralizer and Cleaner is better - because acids eats gaskets and metal and causes leaks. That's the treatment here offered. Car radiator Leak? This one works like blood. Coagulates upon contact with air. Non-clogging. The Mega Power Stop Leak stops car radiator leaks in seconds. Non-glog. No strings, no pellets. Hold 50lbs pressure. 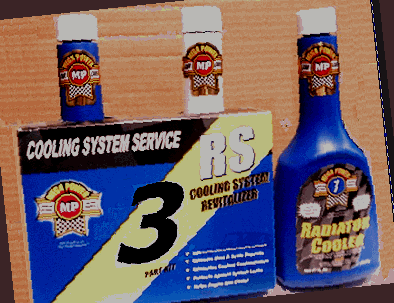 Works on headgaskets & manifold leaks, stops heater drip leaks, even engine block leaks. Select your need here... Deals for shop resell and fleet service - bottom of page. Ordering: Comes 3 as shown. Or order separately. One 3 part Mega Power Radiator System Stop Leak as shown. Comes with directions, phone help if needed, guarantee. Delivered to your door in about 3 days. $49 plus $16s&h=$60 total. Order the Mega Power Stop Leak Product 12 oz. Works well up to 3 gallons coolant or water. Stops radiator and gasket leaks. Holds to 50 LBs. Shipped to your door in 3 days by FedEx. Just $12.95 each. Plus $5s&h = !7.95 Total. Order 2 stop leaks here for large trucks equipment. 6 Mega Power Stop Leak Products Just $6.95 each. $41.70 Plus $15s&h = $56.70 Total. Save $36. 12 Mega Power Stop Leak Products Just $4.95 each. Just $60.00 $15s&h = $75.00 Total. Save $72 wile this sale runs. Stops water and any anti-freeze coolant leaks. Hold 3 times the pressure in your radiator. Non-cloging. Works like blood. Circulates in liquid form. When passing into the air from a leak, it coagulates, sealing the hole - like your blood does in a cut. Keeps motor oil and the engine head and transmission running cooler because it packs more coolant in a square inch. This allows heat to transfer from engine block to outside air faster, lowering temperature as much as 40degress, some car and bus owners tell us. Keeps automatic transmission fluid temperature heat exchanger inside the radiator, exchanging hot temperatires in the transmission fluid circulating tto the radiator for cooling purposes, cooler. a transmission protector in that vital sense. 3 items included to stop leak, cool better, and protect against further damage. Works with water or anti-freeze. 3 to 4 gallon systems. Order 2 treatment for larger systems. One treatment for each 5 gallons coolant. Order below online or by phone at 512 665 3388 . One 3 part Mega Power Radiator System Stop Leak as shown. Comes with directions, phone help, guarantee, FedEx delivery in 3 days. 6 items total. $79 plus $16s&h=$90 total. 9 items total. $105 plus $20s&h=$125 total. 18 items total. $180 plus $20s&h=$200 total. Other car radiator leak aids to cooling your engine and transmission. Demo.